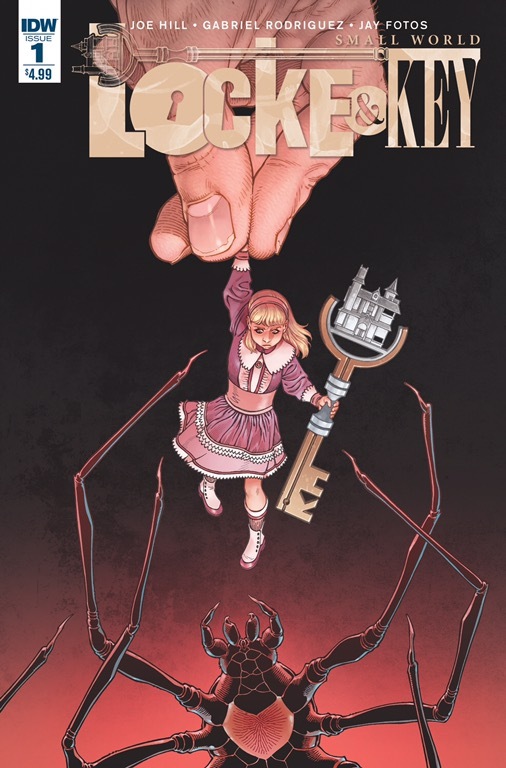 It is time for a return to Keyhouse, with a one shot, set before the events of the original Locke & Key series. The series has flirted around with showing various time periods before. The magic keys that can alter the rules of reality take center stage, while the Locke family provides the necessary heart to keep readers from being overwhelmed with fear. There is an overt effort to sell the turn of the twentieth century setting. Harland Locke is seen reading W.E.B. du Bois. Chamberlain Locke is overtly pushing the life of a homemaker on his daughters, Mary & Jean. This is despite Mary verbally making it clear that she is both extremely knowledgeable and cunning. Joe Hill’s dialogue is anything but subtle. The whole exchange can be read as an stereotypical attempt at authenticity or as a way of poking at decaying Victorian age ideals. This latter point of view makes the reading not only more palatable, but humorous in interpretation. Anyone not clear about who the members are of this dynamic family are helped along by several things: Rodriguez & Fotos dynamic facial expressions and Robbie Robbins clear lettering. Rodriguez art and Fotos colors work strictly with traditional panel layouts, except for one scene in the dining room. It’s a two page spread that provides a cursory introduction overhead as well as close-up, all at once. Robbins’s lettering works in conjunction with the overlapping panels in this scene. Instead of fighting with the extra gutters and panels, it becomes part of the borders, providing natural and easy to read transitions. The character of Fiona Locke could easily be mistaken for another child in the family. Both her hair and dress come across as rather young. New readers could also be confused by the assorted shadows serving the family members. Small bits of dialogue and interactions among the family are laced later on in the story, to make it clear that Fiona is Chamberlain’s wife and that the shadows are controlled by the crown (which holds a key) atop Harland, then later Ian’s head. The fact that this is a house of magic, controlled by keys, is not hidden. The amount of detail in Rodrieguez art can be overwhelming, if you try to look at it all I detail. While just reading the issue, and not thinking much about it, readers can find themselves in an immersive environment. Upon looking at each grain of wood, hair on human or shadow’s head or beard, or the sharpest point on a spider’s fangs, the detail is massive. The same can be said of Fotos’s colors. Each splash of water, drop of blood and candle lit glow or shadow is carefully placed, gradient rendered and blended with Rodriguez’s art. It’s a pairing that is not only to be admired and desired, but continuously enjoyed for its beauty. The pacing of this issue seems to take a Barney Stinson view of mixtapes: all rises. 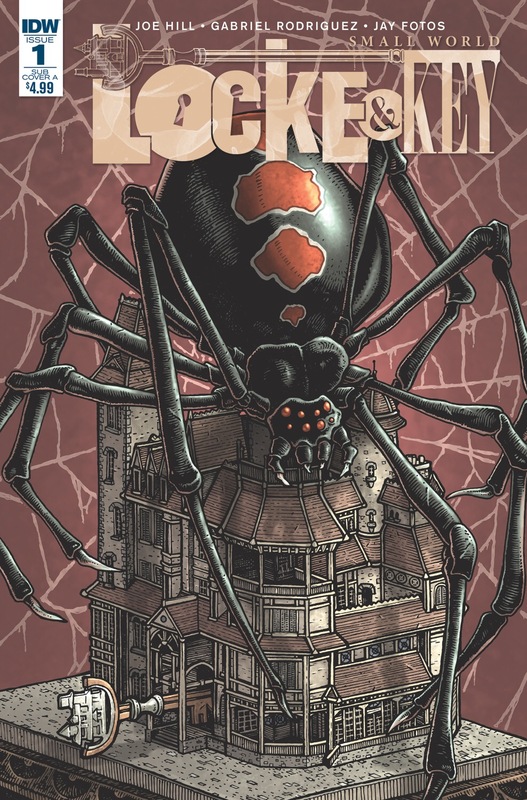 The story immediately introduces the “Small World” key and family, moves to hijinx, then horror, survival and the endearing solution that makes it a Locke & Key story. Readers will find themselves tearing through the tale, just to know the solution, the going back and looking at all the details again, trying to pick out what was missed the first time around. In the back-matter interview Hill makes it clear what horror legend shaped this story. Horror fans will have no trouble picking up on the story’s influences. Those who have never experienced this series before will get a taste of the fun house of horrors that await, if they choose to dive into the main line. All readers will experience the well paced horrors that are mellowed by the heartwarming touches found within the Locke family.